Investigators can search for funding opportunities using publicly available sites such as Grants.gov. To ensure that warfighters today and tomorrow have superior and affordable technology to support their missions, and to give them revolutionary war-winning capabilities. establishes policy for, administers, and coordinates most federal assistance to education. Fully integrating technology into schools, assist individuals of all ages with disabilities in the acquisition, utilization, or maintenance of assistive technology services or devices, improve student achievement through the use of technology in elementary and secondary, increase the capacity of States to design, conduct, and procure high-quality evaluations of educational technology. Advances national, economic, and energy security; to promote scientific and technological innovation; and to ensure the environmental cleanup of the national nuclear weapons complex. P3, biotechnology, benign manufacturing, transitioning from high risk pesticides, indoor air in developing countries, new vehicle and fuel technologies, harmful algal blooms, bioenergy production, diesel emission control and others. Promotes science in pursuit of fundamental knowledge about the nature and behavior of living systems and the application of that knowledge to extend healthy life and reduce the burdens of illness and disability. Research Projects, Support for Conferences and Scientific Meetings, Academic Research Enhancement, Exploratory/Developmental Research, Clinical Trial Planning, Bioengineering, Biomedical Information Science and Technology, Research on Ethical Issues in Human Studies, Institutional Development. Protects and provides access to our Nation's natural and cultural heritage and honor our trust responsibilities to Indian Tribes and our commitments to island communities. Promotes research and education in the sciences, mathematics, and engineering. Initiatives are directed to high priority transportation research and development requirements in the Operating Administrations. planning, design, and construction of transportation improvements (e.g., highway, transit, and airport improvements). 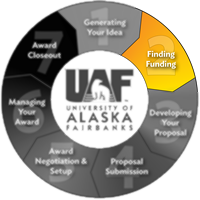 A limited amount of funding is available for research and development projects.